When you look at rushing waterfalls and rivers, you may not immediately think of electricity. But hydroelectric (water-powered) power plants are responsible for lighting many of our homes and neighborhoods. 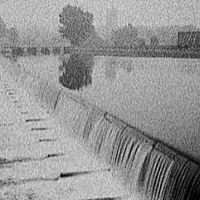 On September 30, 1882, the world's first hydroelectric power plant began operation on the Fox River in Appleton, Wisconsin. The plant, later named the Appleton Edison Light Company, was initiated by Appleton paper manufacturer H.J. Rogers, who had been inspired by Thomas Edison's plans for an electricity-producing station in New York.